Serving others isn’t always a glitzy job. But this spring, Biola hosted a glittery gala to honor some of the Biola women whose servant-leadership is making a significant difference on campus and in the community. The annual Ruby Slippers Ceremony, held each March in conjunction with Women’s History Month, highlights the contributions of alumnae, students and staff members who model Christian character and service in their lives. 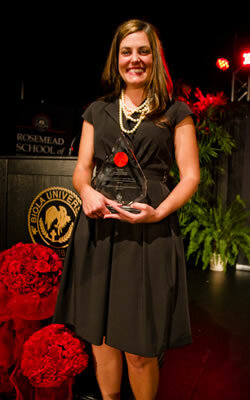 This year — the third year that the event has been held — Ruby Awards were presented to the following Biola women. Joanne Jung has a passion for seeing God’s word take root in the hearts of those around her. As an assistant professor of biblical studies and spiritual formation, she has established herself as a dynamic instructor, extending her teaching and ministry beyond the classroom and taking an interest in the lives of her students. She is also an active member within her church community, with experience in leading church plants and overseeing women’s small groups and Bible studies. For students who live on campus, Beth Tabor is one of the key ingredients in helping school to feel like home away from home. As associate dean of residence life (where she oversees the resident directors of each dorm) and a former resident director herself, Tabor has earned the trust and respect of her peers for her integrity and wisdom. She is assertive in her leadership and gracefully encourages her peers. During her time as an RD, she had a great influence on the young women in her dorm — many of whom continue to keep in contact with her. She has displayed care, courage and wisdom in dealing with dozens of female students struggling through the realities of unwise choices and difficult developmental obstacles. Dee Henry has been “serving” — a pun she’s fond of — as a tennis coach and instructor at Biola since 1971. In that time, she has coached a national singles champion and a national champion doubles team, to name just a couple of her stellar achievements. Her love for the sport of tennis has also led her to become involved in wheelchair tennis. As part of this ministry, she taught herself how to play tennis from a wheelchair so that she could know firsthand what it felt like, and how to encourage athletes in wheelchairs. She has been honored by the Southern California Tennis Association with a lifetime achievement award and by the United States Professional Tennis Association as Coach of the Year, Handicap Pro of the Year and Special Needs Coach of the Year. Judy TenElshof was the very first female professor at Biola’s Talbot School of Theology. 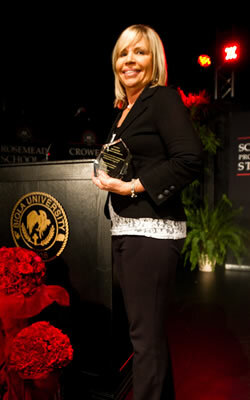 Her mentors, colleagues and students know her to be a woman blessed with great vision. This vision led her in founding the Hilltop Center for Renewal, a retreat center where pastors can experience solitude and receive encouragement for their ministry. This vision led her in developing the Institute for Spiritual Formation, a thriving program at Talbot. This vision has led her in ministering to pastors and their families, serving as a spiritual director for Talbot students and training up countless godly men and women who have gone on to disciple the people of God all over the world. 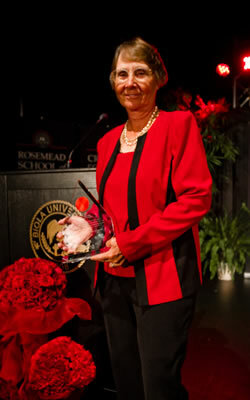 As the first-ever recipient of the Anna Horton Award, TenElshof is recognized as following in the footsteps of Mrs. Horton, the wife of Biola founder T.C. Horton and Biola’s first dean of women. 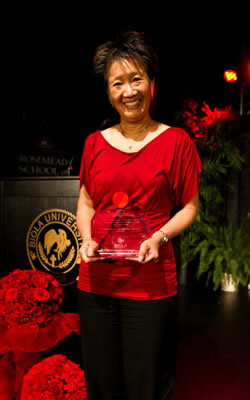 The purpose of the award is to honor a woman who, like Horton, displays a commitment to living life alongside Biola students, caring for their spiritual development and lending support for them in their journeys.